I am a fan of the conventional TV show. I like my shows resolved within 30 minutes to an hour. Lost is the exception to this rule, in which it is a continuous story from the first to the last episode (or serial drama). But even so, watching this show takes an extreme amount of patience. I keep waiting for the bad guys to get theirs, in particular Benjamin Linus. At least with the procedural shows (i.e. the 3 CSI shows or the 12 Law & Order shows) the bad guys usually get caught within an hour. Fortunately, after this season there is only one more left. Six (or seven, I lose track) seasons is a long time to wait for justice. I have two different kinds of DTV converters, a Magnavox and an APEX. The Magnavox I bought at Sears. It is not a very good product. The APEX was bought for me as a gift at Best Buy. 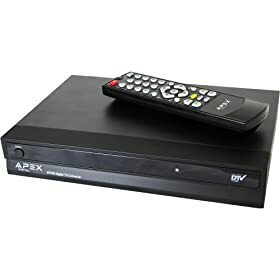 The APEX has volume control, the ability to save favorite channels, and the ability to delete any particular channel you don’t want. It also has an easy closed caption button on the remote. The remote is also very intuitive and follows the design of most TV or satellite/cable remotes, with its standard 4 direction arrows with the OK in the middle set apart from the rest of the buttons. The Magnavox sold at Sears. 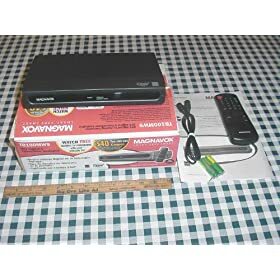 The Magnavox is not such a good product; it currently has 2 stars at Amazon.com. It has no volume control – which actually is not that big of a minus, how many people hate having three different volume controls? Strangely enough, the user cannot delete a single channel, they can only delete groups of channels. What I mean is this, ABC is 13.1 and one of the Spanish channels is 13.2. I don’t have any way to delete 13.2 without deleting 13.1. That is very annoying. Also, the remote is not intuitive at all, with the menu direction arrows all being small buttons nestled to the right of the remote among other buttons, and the OK button being on the left side of the remote in a non-obvious place. It is very difficult to navigate menus in the dark. This difficult menu must also be navigated just to turn the closed caption on and off. Cheers to Boston Legal for only doing a 1 hour Season Finale. I don’t know why, but it bugs me that every show feels that they have to do a 2 hour Season Finale Spectacular where something really special happens. Part of me feels like a 2 hour episode should be reserved for only special events. Maybe this is a holdover of my comic book days, where every 5 issues they felt they had to do a super-duper special issue (that also happened to cost twice as much). Cheers to Lost for the twist they threw right in the end, and the manner in which they did it, and they did so without even throwing in yet another special character to advance the storyline. The last 2 minutes really left me waiting for the next season, as all good season finales do. Jeers to American Idol. I like the show, and I’m okay with it taking 2 hours to announce the winner. After all, they have special guests and musical performances that entertain. I’m okay with 2 hours. But c’mon, 2 hours and 7 minutes! I don’t know why, but the extra minutes really bug me. Can’t you fit the show within 2 hours? Jeers to On the Lot for trying to be like every other single reality show. On the whole, I think it is a great, original reality show. However, why does every reality show feel like they have to follow suit and take 5 minutes and a commercial break to announce who is going off the show? And, it’s not really that suspenseful when you have 18 people on the show and are booting off 3. You don’t need a whole hour, especially since we are not that far in the show anyway. I find it somewhat ironic how formulaic reality TV has become. When reality TV started to explode in popularity, I would say the late 90s, it was successful because it was something new and innovative. But really, as soon as the format came out, reality shows really started to just follow a certain pattern. Many of the shows overall pattern is the same, in which someone gets voted out each week, or at least eliminated in some way, whether it is the Bachelor, Amazing Race, Big Brother, or the Biggest Loser. That’s not so bad, but it does hurt originality somewhat. There are just particular patterns that really annoy me. The “let’s show what’s going to happen after the commercial break right before we go to commercial break” in which we see the same sequence over and over, or “let’s go to commercial right before we announce who gets kicked off”, or the announcer continuing to say this is the most exciting rose ceremony yet. For a television format that is supposed to be so innovative, all these shows are becoming so cookie-cutter. I know these observations are way outdated, given that these shows have been out a while, and I know I am probably not saying anything original, I just wanted to point out in television, things that are supposed to be “outside the box” eventually just make the box bigger. The new format of dramas, and even some comedies, have been interesting as well. This format is one in which each show builds upon the other. Many shows do this to some degree, but dramas are becoming more like a miniseries with no definitive end. “Lost” is the best example of this, and probably one of the first to take on this pattern. We know the show has to have an end, we just don’t know when. People are stranded on an island from a plane crash, and we assume at some point they will escape. Other series, like “Jericho” or “The Nine” (which I haven’t seen but can assume based on commercials) are basically one long story. The characters, and the view, find out more about what is going on as the story unravels. This is a great format, but this is somewhat riskier. A standard type drama series, like CSI, one in which focuses on separate stories per episode, can go downhill, but it will not affect the earlier shows. Think of a movie or book that you really enjoyed for the most part. There were things to figure out, and certain mysteries were unraveled as you went along. However, the book or movie goes downhill, as certain explanations are somewhat contrived to fit the earlier half of the story, or they are somewhat anti-climactic. That is the issue here. Do the writers of “Lost” actually know where they are going with the show. It is exciting right now, but what if they disappoint us? If the ultimate ending or even later shows turn out to be disappointing, it will affect the entire series.